Commercial cooking equipment is used in end-use industries such as restaurants, hotels and food junctions. Various cooking equipment are available in the market which helps the restaurants and food junction to operate efficiently. Rising investment in hospitality sector is increasing the buying power of restaurants and hotels for advanced cooking equipments. Moreover, this investment is raising the penetration of new and modular restaurants across the globe. Rapid growth in urbanization led to busy schedule of working population across the globe, thus shifting consumers towards quick-service and quality food. This will create a pressure on restaurants to adopt advanced cooking equipment in order to provide better and quality services. The global commercial cooking equipment market is predicted to expand significantly at a CAGR of 5.6% over the forecast period i.e. 2016-2023. Further, the market is expected to account for USD 1.5 Billion by 2023 from 973.1 Million in 2015. On the other hand, Asia-Pacific commercial cooking equipment market is expected to be the fastest growing market during the forecast period i.e. 2016-2023. Thriving tourism industry and increasing investment in hospitality sector to provide better services to the customers are some of the major factors which are swelling the demand for commercial cooking equipment in the region. However, China is expected to dominate the commercial cooking equipment market in Asia-Pacific region on account of increasing restaurants and food junctions. Increasing consumption of fast food and increasing gross disposable income of the population are shifting the customers towards quick service restaurants. These restaurants are adopting advanced cooking equipment in order to serve better to the customers. Moreover, restaurants and hotels are undergoing remodeling and changing the kitchen structures to enhance the services and cooking techniques. This will further help the restaurants to increase their profitability by adopting times savings cooking equipment. Multi-cuisine restaurants and large hotels are shifting towards sophisticated cooking technology in order to increase the efficiency of services. Increasing number of hotels and restaurants across the globe is growing the demand for cooking equipment. Various restaurants are shifting towards advanced cooking equipment with the purpose to enhance their services and quality of food. Increasing adoption of energy efficient cooking equipment in restaurants on the back of rising concern towards energy saving equipment is swelling the demand for commercial cooking equipment. Moreover, introduction of compact and easy to use cooking equipment for commercial purposes in the market is expected to upsurge the growth of cooking equipment market. Likewise, increasing expenditure of hospitality sector along with flourishing travel and tourism industry are arousing the concerns in restaurants and hotels towards better and quality services. In addition to this, factors such as increasing hygiene and sanitation requirement in commercial kitchens, growing culture of consuming ready to cook food, hectic lifestyle of working population owing to urbanization, are some of the major factors likely to foster the demand for commercial cooking equipment over the forecast period i.e. 2016-2023. The market of cooking equipment is majorly driven on the back of increasing need of less time consuming cooking equipment in commercial kitchens. 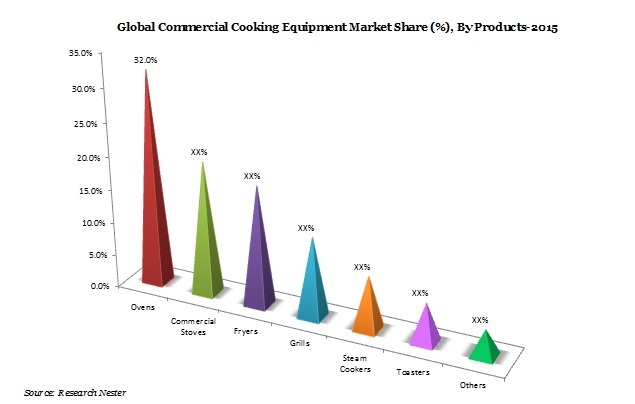 This will further foster the growth of commercial cooking equipment market in near future. However, high cost of commercial cooking equipment which results in increasing the cost of ready to cook and processed food, presence of stringent regulations on the manufacturing of cooking equipment for commercial purposes, high capital investment and complexities related with the installation of equipment are some of the factors which is curbing the growth of commercial cooking equipment market across the globe.